For ITRANS installation instructions, see ITRANS. Note: Computers running Windows XP cannot be used to send claims. After a claim is sent, if the response is not a rejection notice. After a claim reversal request. After a request for outstanding items (each item will print separately). After a payment reconciliation request. On each computer where claims are typically processed, set the default claim printer to a PDF printer. (File, Printers, Claims). In File, Printers, Claims, select the Prompt option. Then you will be prompted before printing begins and have the option to cancel the print job. A form with the above title will print when a response from ITRANS is unknown or invalid and will usually occur when running the request for outstanding transactions (ROT). An ROT causes this issue in Open Dental when the practice used to send claims to ITRANS through their previous practice management software and then switches to Open Dental. In this situation, ITRANS will send responses to Open Dental which belong to the old system and Open Dental will not have all of the data it needs in order to display the response properly. For example, the practice sends a claim in the old software and later switches to Open Dental and runs an ROT and the response to the ROT is an EOB regarding the claim that was sent in the previous practice management software. The form that prints is a basic and shows the contents of the message from ITRANS so the patient can be manually located and updated. Verify that the correct version of ITRANS is being used. The version of ITRANS can be located within the upper right portion of the error message (see the red circle in the screen shot). The version must be 2.4.0.1 or greater. Look at the error message number toward the top of the message (e.g. error number 1001) and go to http://www.goitrans.com/itrans-support-error-codes/for possible resolutions. If you see an different version of ITRANS, then the issue may be due to a previous installation of ITRANS which is still registered, possibly due to another practice management software that was previously installed. It is possible to unregister the old version of ITRANS by calling Continovation support for help, but this issue is most easily fixed by installing the proper version of ITRANS on another computer instead. Error 1001 (preceded by Dart error 12020) OR in version 3.0.0.0 and greater receive the error message "The credentials supplied to the package were not recognized - 1001"
Indicates a corrupted certificate. The most common source is an administrator forcibly changing a password on a user account which scrambles all encrypted data in the profile. A less common source of this issue is Microsoft updates. Simply download new ones to resolve the issue. When sending a claim, I get error code 1022, which is not listed at www.goitrans.com/itrans-support-error-codes. This issue occurs when sending claims to Alberta Blue Cross and is due to an incorrect ITRANS configuration. See the section further up on this page for Alberta Blue Cross to ensure that ITRANS is properly configured, then restart the iCAService on your claim server. When sending a claim, I get an error message: "No response from ITRANS. Either a folder share permission issue on the server or ITRANS is temporarily unreachable." or "No response from iCAService. Ensure that the iCAService is started and the iCA folder has the necessary permissions." Make sure iCA service is running. Review the setup instructions above and verify that the iCA service is set to run automatically. If the service has been off for a while, the backlog of outgoing requests has to be sent before service is responsive to new requests. Each backlogged request can take up to 90 seconds to process. To determine if service is processing backlogged requests, look in the shared iCA folder for input.### files (ignore _nput.### files). If there are any input.### files, the service is still processing backlogged requests. Error code 1013 (certificate not found) when sending a claim. Solution 1: This does not happen on a server but happens on other workstations only. This is usually because you have not set the 'Claim Export Path' and 'Launch Client Program' to be from server share. For instance, instead of C:\iCA, these two fields should start with \\YourServerName\iCA. Also in this example, on the server itself, c:\iCA should be shared as \\YourServerName\iCA with proper permissions. Log in to Windows as the CDANetUser. Launch Internet Explorer, Internet Options. Click the Content tab, then click Certificates. Your provider encryption certificates will be listed along with their expiration dates. Click Remove to delete the expired certificates. Do this before installing any new certificates. Install new provider certificates from the ITRANS website: www.goitrans.com. Sending claims for a hygienist doesn't work when using iCA version 3.0.1.0. This issue was fixed in version 3.0.2.0. Or you can install version 2.4.3.1 (no longer available for download). Make sure to uninstall version 3.0.1.0 first. Using Windows Server 2012 R2 and having problems with ITRANS installation. Start the service 'Computer Browser'. This service is stopped by default. I did not find a solution on this page. These steps may be useful if you have an older installation of the ICA service (pre October 2015) and used the wrong user account. 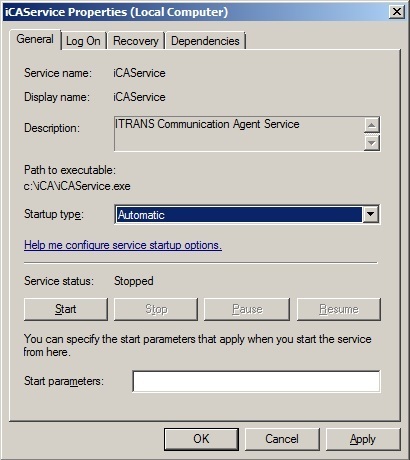 In the Service Manager, change the iCAService to run automatically instead of manually and change the Logon information to run as the CDANetUser where the CDA certificates have been installed. 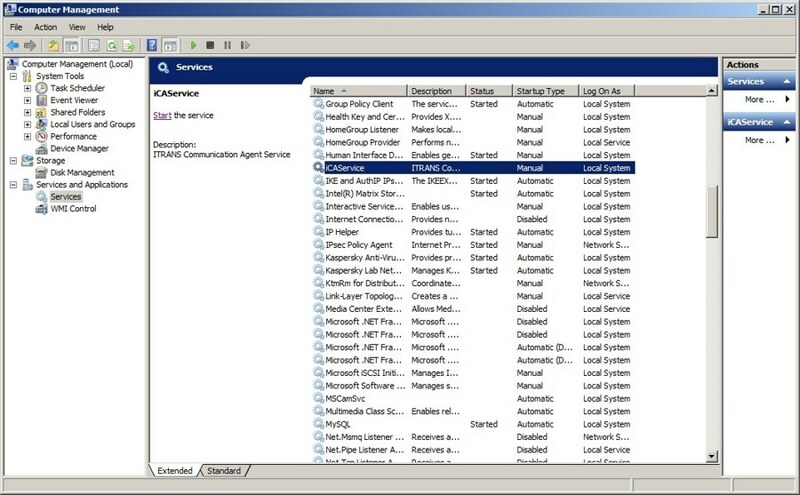 Select the service manager in the left pane of the window. Scroll down and find the service named iCAService. Right click and choose properties. On the General tab change the Startup type to Automatic. Click "This account" then enter the exact name and password of the user created in step 1 of CDA Digital ID above (e.g. CDANetUser). This username and password is case sensitive. If user name and password do not match, you will get a 1013 error when you try sending claims. If the password ever changes, make sure to update the password for the iCAService in the service manager. Click OK to close the Service Properties window.